John’s Children, formerly “The Silence”, were a 1960s Mod band formed by Andy Ellison and Chris Townson, and briefly included Marc Bolan (who was with the band for about four months), alongside Geoff McLelland and John Hewlett. Their manager was Simon Napier Bell, who devised white stage outfits and an outrageous stage act which included fighting each other and Bolan whipping the stage with a chain. 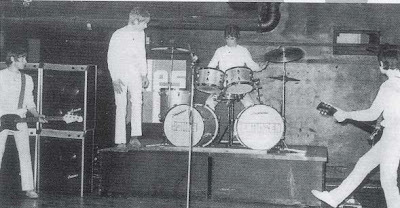 The group were put on tour with The Who in Germany around April 1967. A concert in Dusseldof ended in a riot, and a later concert in Ludwigshafen created such a fuss that the Who nearly couldn’t play. The group were promptly deported. ANDY ELLISON: "We would go into Kingston on Saturday to Modern Man and to get all our mod gear and the right hair cut. Then on to Hammersmith to pick up some blues, purple hearts etc. for the weekend." Check out the new John’s Children website FAN-TASTIC!